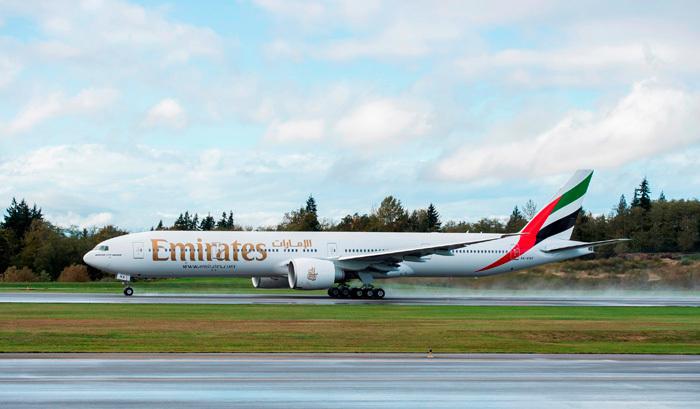 Boeing has delivered Emirates’ 100th 777-300ER (Extended Range), marking another milestone in a partnership that began over two decades ago when the Dubai-based airline ordered its first 777. With this delivery, Emirates will have 142 777s in operation and is the only airline in the world to operate all the 777 variants. With a current direct backlog of 51 777-300ERs, the 777 also comprises the largest part of Emirates’ 213-strong fleet. “The Boeing 777-300ER is one of the most remarkable aircraft ever built, and its combination of efficiency, range and payload is second to none. Our customers are equally excited by the aircraft and its on-board product, and to date over 108 million passengers have flown on an Emirates Boeing 777-300ER,” said Sir Tim Clark, president of Emirates Airline. “We have 204 more Boeing 777s on order, which supports over 400,000 jobs in the United States of America, including those from various suppliers such as General Electric which provides the GE90 engines that power all of our 777-300ERs,” said Clark. The 777-300ER has consistently won many accolades including “Best Aircraft Type” which were awarded based on passenger preference polls, “Best in Class” based on fuel burn, passenger load cost and performance and “Best Residual Value for a Twin Aisle Airplane” among others.